While we were in Barcelona, we did make it to one of the Magic Fountain performances. We had a lot of fun people-watching and fountain-watching while listening to the music. The final performance of the night was Freddie Mercury and Montserrat Caballe singing “Barcelona”. I had hoped they would play the song. Nothing like being in Barcelona while they sing “Barcelona”. 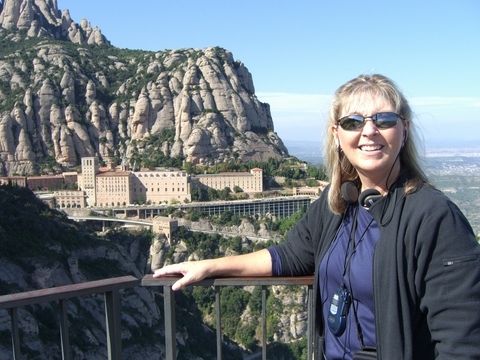 Our trip to Montserrat began with us taking the Barcelona Metro to the Espanya station. 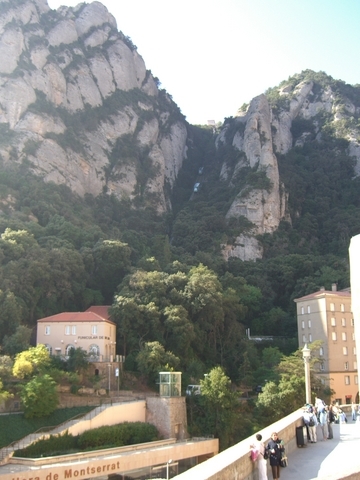 We had to catch the R5 train to Monistrol de Montserrat. Between language barriers and the inability to operate a ticket machine, we barely made it on the 9:36 train. We made it with only seconds to spare which is good since the trains leave once an hour. But that is where our good luck ends. The train was packed. A school group was taking a field trip to the Monastery. We had to stand for the entire trip – over an hour long. The R5 train makes two stops for Monastery visitors. 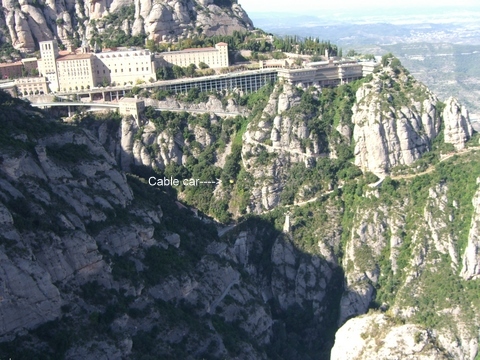 The first stop is for visitors holding tickets to take the cable car up to the Monastery. The second stop is for visitors holding tickets to take the rack train to the Monastery. We bought tickets for the rack train. There was no way we were taking the cable car. Here’s a photo I took to give you some perspective. 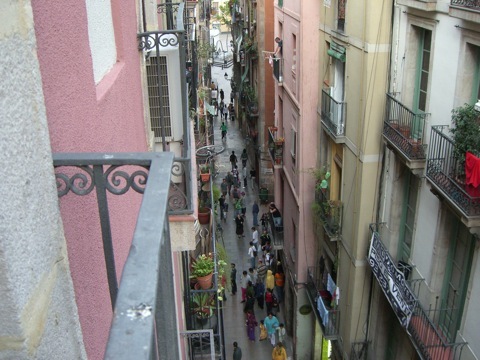 After our arrival, we immediately walked our way up to Placa de Santa Maria. It was here that we ran into our school group on the steps of the placa. 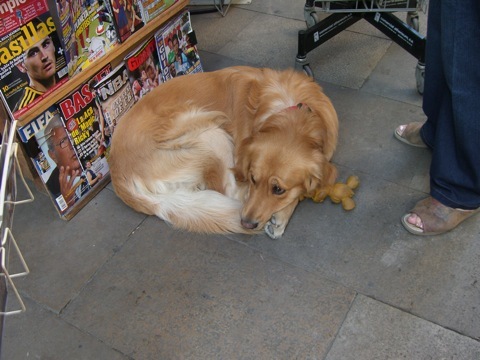 This was the last time I saw them during our visit. We continued up the steps towards the arched portals. As we entered the courtyard and later the Basilica, I recorded the following video. View the high quality version of the video here. For lunch, we ate at the Monastery cafeteria. The food was good and affordably priced. After lunch, we took the Sant Joan Funicular to the top of the mountain. From the top of the mountain, we followed the Pilgrim’s path to the Sant Miguel Cross. 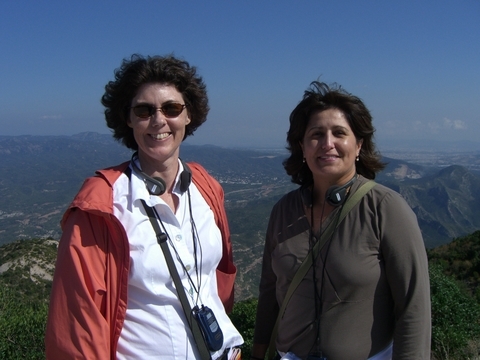 Shawn and Vic on top of the mountain overlooking Montserrat. The high quality version is located here. Earlier in the day, the line to see the Black Madonna was crazy long and we couldn’t bring ourselves to stand in it especially after standing for an hour on the train. When we returned to the Monastery from our walk, we noticed that most of the visitors had left the grounds so we headed back to the Basilica. We were able to walk straight up to the shrine and touch her right hand. 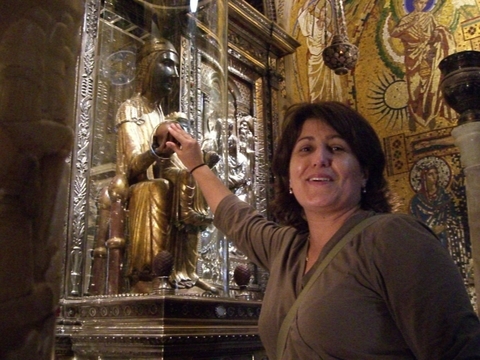 Vic touching the right hand of the Black Madonna. Here’s the two minute version of our 15 minute train ride down the mountain. Higher quality version is located here. 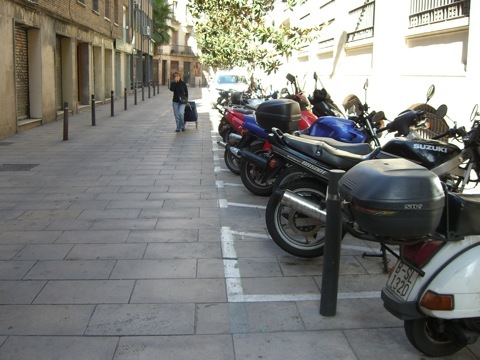 Check out the parking spaces for motorcycles and scooters. 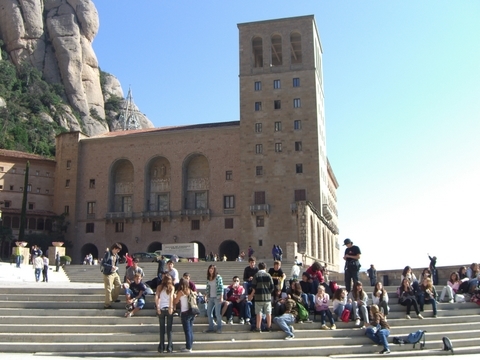 Today we went to the Monastery at Montserrat. After listening to the Boy’s Choir, we took the funicular up the mountain to overlook the monastery. We decided to walk down by following the Pilgrim’s route. 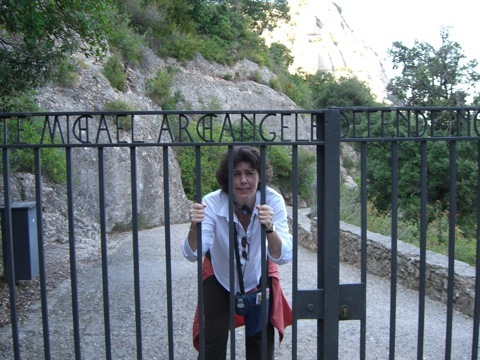 We ran into this gate on the way down.